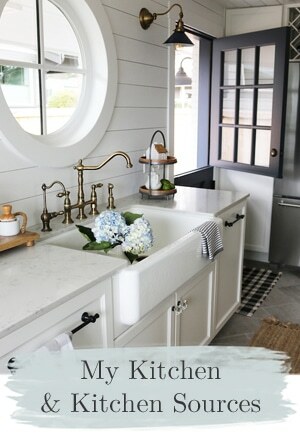 While many people love an all white kitchen, I’ve been receiving emails asking to see images of kitchens with wood cabinets and cabinets painted something other than white. 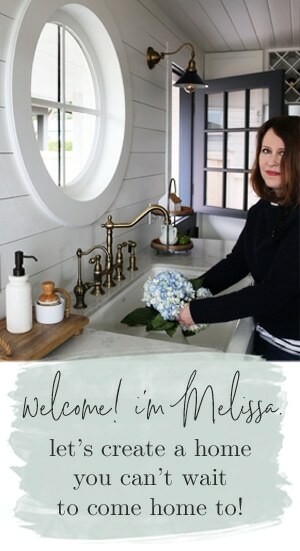 It is interesting because while I too have loved white kitchens, I’m more and more gravitating towards something more unique but still full of charming, modern and traditional elements. Every Fall I get all inspired by kitchens, and with the arrival of a crisp breeze through my windows this week, I’m right on cue to be thinking about baking and cooking again! So let’s take a little tour of some kitchens today, shall we? First up, above, I love how unique that kitchen is with the antique looking dark cabinets, dark walls, white trim, and the funky turquoise refrigerator! The open shelving on the wall keeps the room from feeling too heavy. And the chandelier is a touch of elegance. You could not be depressed or cold in a yellow kitchen (above)! And I love the island table that serves as a perfect workspace without being visually overbearing! The heaviness of dark cabinets in the above image is broken up by the white counters, pops of yellow and the removal of heavy upper cabinets. And I love the old wood table serving as an island! I think this steel island is pretty awesome. Refacing a few cabinets or your island with metal would be a great solution to break up a sea of white or wood cabinets. I usually don’t love light wood kitchens but this one still grabbed my attention. The collection of white pitchers, the colorful pottery and accessories, and the metal pendants all contribute to the overall mood. The windows above the cabinets keep this kitchen light and airy but the blinds, rugs and wood toned cabinets give it just enough warmth to be cozy. And how about a very dark kitchen? Love the mood in this kitchen with the patterned floor, the glass front cabinets, metal bar stools and the contrast of white walls! So much character! So even though the main cabinets are white, this kitchen is anything but typical white. The island is unique, the mirror above the sink and the upper shelving supported by metal brackets give the whole room a lot of personality. Shocking blue? Yes, why not. 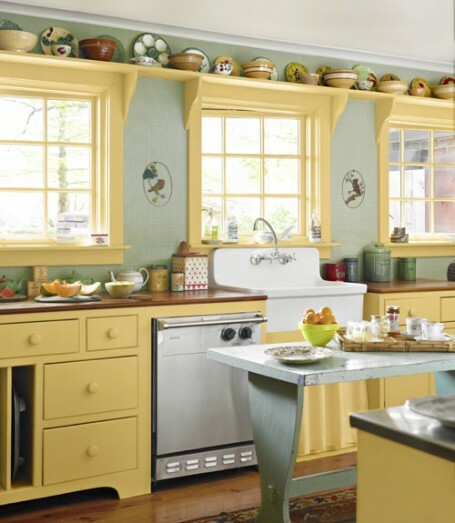 If you feel like your kitchen needs a little punch, or if you have a kitchen full of wood cabinets that you’d like to freshen up but don’t want to paint, a bright and cheery island might be all the color you need! Tell me about your dream kitchen! What would the cabinets look like? More kitchens with color and personality! Oh thank you for posting this! I’m always looking for colour inspiration & all I seem to find these days is white. No problem! It is fun to think outside the sea of white to what other ideas are possible! I’ve been wanting to put my paper towels on the end of the island FOREVER! Maybe now I should just do it. Well, YES! You should. It makes sense!! I love that yellow kitchen! 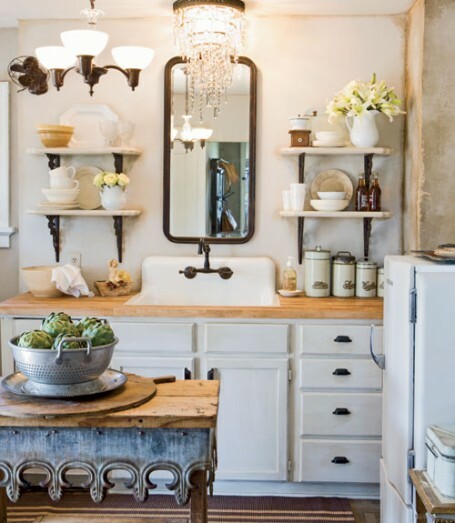 I still love a white kitchen, but I’d love an island made from an old piece of furniture or barn wood – something with a little character! Or maybe old barn wood floors as a contrast to the white! Just daydreaming here! I love that blue island, too. A little bit of excitement in a small dose and i bet it makes chopping veggies and fixing dinner more fun! I have thought a lot about what my dream kitchen & cabinets would look like and I think I have finally decided I would be very happy with mostly white cabinets, very light gray for the walls and some fabrics, and of course yellow where ever I can find a place for it. Right now, I have all stainless appliances and they would stay. The floor is a charcoal and white checker board pattern and I love it so that would remain also. The island base and our (currently white) table and chairs might all become gray. The backsplash and countertops are still a question mark. I think this scheme would allow me to bring in colors I like for each holiday season without clashing. Thanks for this post and giving me an excuse to spend a few minutes dreaming! I have to say that I’m not fond of the latest trendy “no-upper cabinets-and-open-shelving” look. I struggle to see the practicality. Granted, all of the magazines photos show insanely large beautiful windows where the cabinets once were, and while I’m totally jealous of all that gorgeous sunlight, all I think is that you have to bend down to get to your dishes! The open shelving is nice for display items, but God forbid the sippy cups and travel mugs be in view (GASP!). These seem like great kitchens for people who have large pantries; storage for food, dishes, appliances, and everything you use to cook. I am curious in these kitchens if there is a sea of floor to ceiling cabinetry on the opposing walls. :) All that’s missing in the photos is a lady in her thick-rimmed glasses chopping away at fresh herbs from the organic tote bag full of fresh vegetables she got at the local farmer’s market, while she sips a glass of red wine, and entertains 2 laughing friends…add a few little girls running around in white linen dresses to make it look like people “live” there. I have a tiny kitchen where cabinet space is prime real estate, I guess I’m coming at this from a different viewpoint. If I were bulldozing my house and building a custom home with someone else’s bank account, I would probably throw in some giant windows and a pantry. But for now, there’s no way I want my rice cooker and canned foods on display. I know what you mean. I’ve written a lot about why I believe in having some open shelving and how I manage it. Clearly having sippy cups and travel mugs out in the open would not be advisable! 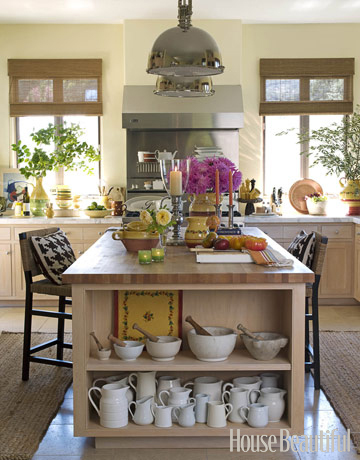 And in a smaller kitchen, you may not have an option of open shelving. 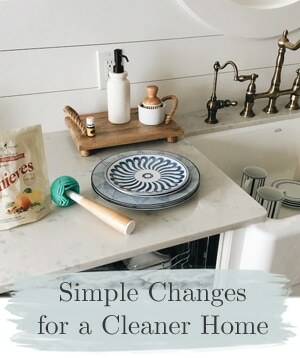 However, I’ve had small kitchens and removing doors on a couple of cabinets or open shelves or glass fronted cabinets made a world of difference in how the room felt! It makes it feel bigger and more airy. The secret to effective open shelving is to have pieces that are both pretty to look at AND functional for every day use. 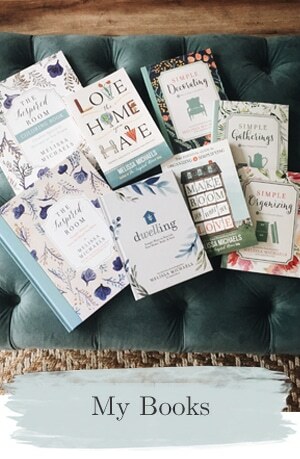 That way they don’t have time to collect dust (you use them every day) and you aren’t using valuable shelving space for purely decorative items you don’t need. But, I realize it is not a look for everyone or every kitchen! Well, Melissa, this is a real “foot-in-mouth” moment for me…I must have been in a funky mood when I left that comment (forgive me please!) because I sounded like a total jerk. Well, I completely joined the ranks with fellow bloggers-along with slipcovered white sofas, bookpage wreaths, and posting pics of my mantel, I too, removed a cabinet door just to see what would happen. And guess what? I love it! It is way more practical for me to store my vitamins in a cute basket that I can pull down and rifle through, than search blindly above. And chips you ask? Let me tell you about chips. I can reach any bag any time from a handy basket. My kitchen looks a little more custom, a little more cozy, and best of all, if I want change my mind I just put the door back on. So yeah, my apologies for the snarkiness, a little grace for this girl, please! 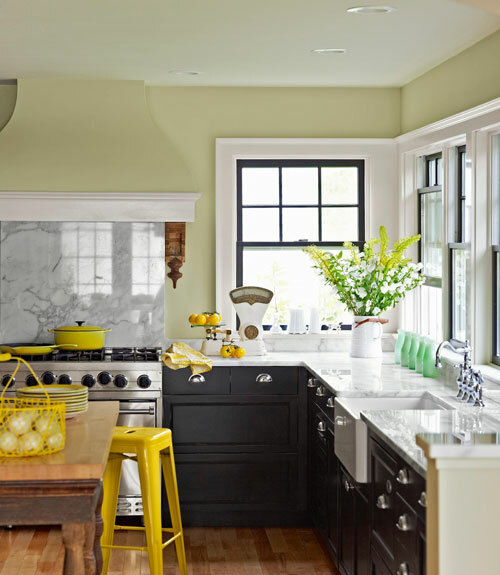 While I may not have the bank of windows shown in the yellow kitchen, I now have one much like those windows, which I am enjoying very much. That yellow (and green) is so nice. 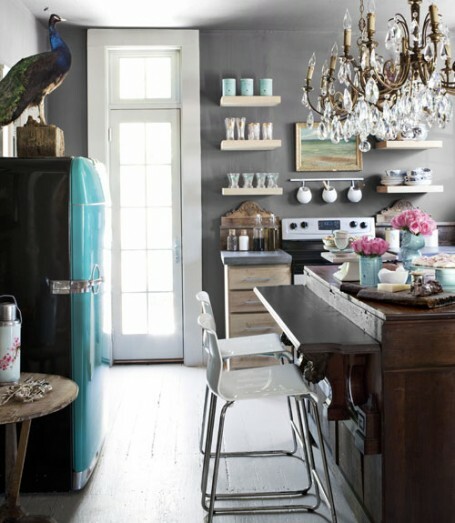 I’m going to go with something much, much more neutral, but I adore that kitchen. 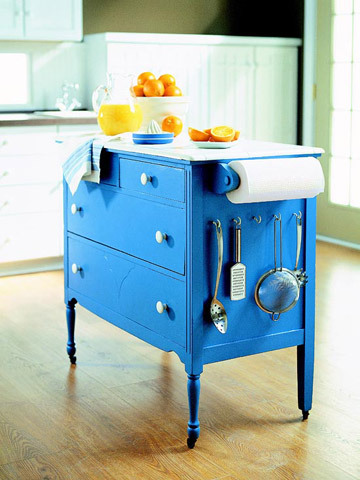 What a cute idea with the blue dresser island. I like the industrial look of the metal one but I was thinking that I want so badly to live in a home with red cabinets but if my fear of painting all the cabinets came about I think painting the island red would fix the desire for color don’t you think?! Yes, I think we sometimes let our fear stop us dead in our tracks. Choosing a less drastic idea makes perfect sense. Go for the red island. Then let us see pictures!!! I just did a post about my dream kitchen. Orange (yes, orange) walls,rustic wood floors and cream-colored cabinets! I LOVE that first one. Oh to find a chandelier like that. 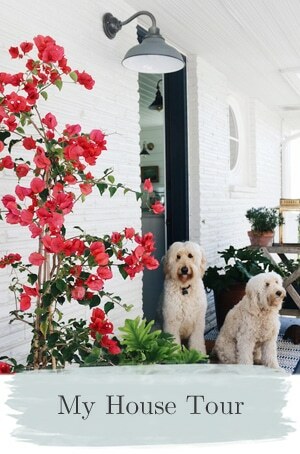 i’ve got maple cabinets and I’m going for it…breaking out the paint, the Annie Sloan Chalk Paint. I keep going to white! They just came out with Pure White and I might just have to do it, except that everyone who has white cabinets wants something else! so funny to me! My other option is to paint the bottoms a gray blue and tops white. When blue is “over” will I regret it! Not that I ever want these pretty blues to go away, but one day we will grow tired of them and move on to something else. Can you ever imagine liking mauve again??? Hope not!! Blue will NEVER be out! Trust me. TeeHee! Great inspiration! I think my new dream kitchen will have yellow….of course! A noncabinet island. Some open shelves. And most of all….lots and lots of windows. I know it’s a dream. But, doesn’t it sound wonderful? 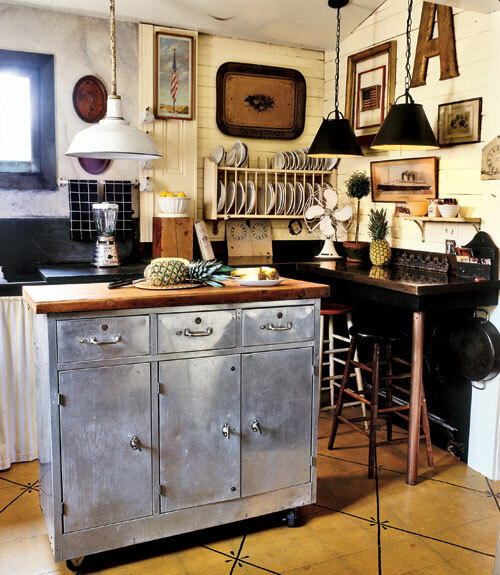 Now you are talking my language…in fact, the photo with the steel cabinet / center isle , is pasted into my IDEA NOTEBOOK I’ve loved that little Unfit kitchen for years and that painted floor ALWAYS STANDS OUT TO ME! I like that first one too. Oh I love kitchen #3!! I’m seeing more color and I LOVE that too. Some of the kitchens are lovely in magazines but they just seem like institutions to me. These are very cozy. What a great place to make soup and savor there in that warm atmosphere. 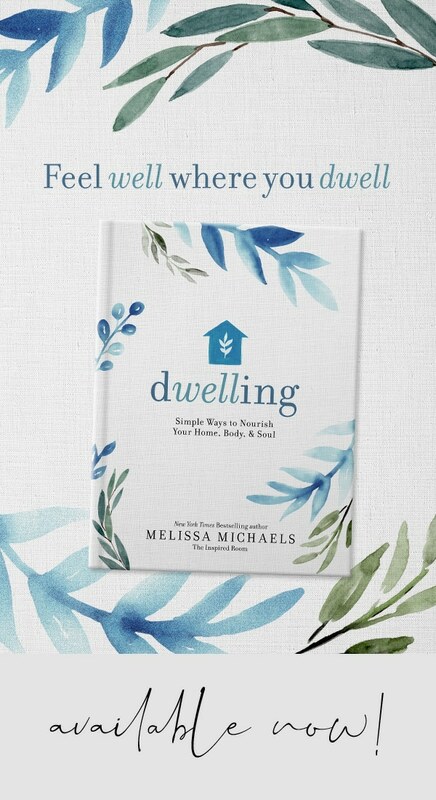 Melissa, Thank you, thank you, thank you! It’s wonderful to see kitchens without the standard white cabinets. Enjoyed looking at unique kitchens. When I bought my house, it was a spec home, so I had no choices in colors for the kitchen, but I love the dark wood cabinetry that I have, with the gray-brown granite countertops. I probably wouldn’t have chosen the colors myself, but I’m glad that I didn’t have to – as I love them! I have a home built in 1940. I have the cottage look. Barn red, gold, blues and green. tan tile floor. Red and white check curtains. What is name and brand of yellow paint on cabinets? Want it!